So a while back I managed to get my hand on a few pre-5th Edition Pendragon bits and pieces, and I could have sworn I’d reviewed them here but I hadn’t, so here’s my quick thoughts on them. First up was a nice boxed set of 1st Edition Pendragon. Interesting in part as a historical item, it’s notable just how much of the structure of the game was in place right there from the start – in particular, the revolutionary personality trait and passion system was right there. 5th Edition is a bit more focused in the way the core book assumes that your homeland is Salisbury, which is sensible for making characters for the Great Pendragon Campaign framework because that’s at the heart of the action at the start of that, but this box was designed before that framework was in place and so offers character gen for knights from a range of homelands. Whilst Stafford does note that the presence of female knights is, by default, assumed to be not a thing, he does point out that this is largely an upshot of the original troubadours writing to the social norms of their time, and that as residents of modern times we have the capacity both to work in our own ideas and draw on concepts and traditions of warrior women that the original troubadours might not have had access to. The set is also nicely rounded out with a poster map of Arthurian Britain, which will enhance play with any edition of the game. The 4th Edition of the game is a big fat book and, unfortunately, lacks the focus of other editions. 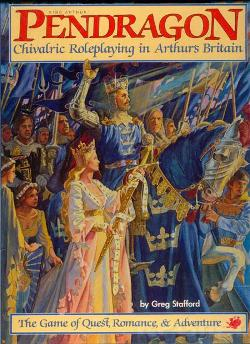 A desire to broaden the game opens up a range of non-knightly character generation options, including magicians, whereas I’m of the view that magic is not really a tool for PCs to use in a reliable, repeatable way in a Pendragon game – rather, it should be an environmental factor encountered in adventures, something outside of the PCs’ control and common experience most of the time which spices things up whenever it appears. In general, this dilution of Stafford’s original concept is unwelcome. 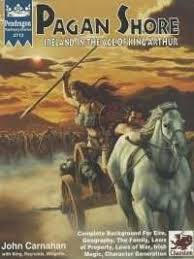 That said, 4th Edition did have some interesting supplements, such as Pagan Shore – a treatment of Ireland sufficiently definitive that the 5th Edition Great Pendragon Campaign actually recommends you consult it if the PCs go there. Penned by John Carnahan, it offers a view of a world derived from Irish mythology mashed up with an invasion from across the Irish Sea inspired in part by Henry II’s campaigns, offering the sort of mashup of history and mythology which has been part of the whole Arthurian deal ever since Geoffrey of Monmouth did his thing. So a while back I posted an article called Pendragon (Sort Of) Comes Home, reporting on how the new regime at Chaosium and Nocturnal Press had reached a deal on collaborating on getting Pendragon-related material out there. 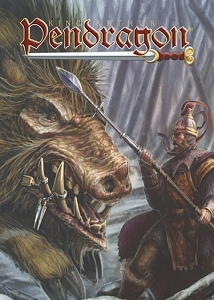 Well, we can drop the “sort of”: Chaosium just announced that they have regained the rights to Pendragon from Nocturnal. (Go read the announcement, by the way, it’s got a really lovely anecdote about White Wolf and Chaosium toasting each other at Gen Con once.) Whether this includes the new Paladin line isn’t clear, though since the print-on-demand proofs for Paladin were recently sorted out I’m not so concerned about that – delivery of that project seems to be imminent regardless, and given the new regime at Chaosium’s approach to Kickstarters I’m sure they would want to make sure everyone with skin in that game gets what they are owed if only to avoid damaging the game line’s reputation. I imagine negotiations on this must have been grinding on for some time – you just don’t make this sort of decision based on a passing whim – so odds are Greg Stafford was aware when he died a little while back that this particular one of his babies would likely be coming home for good. Chaosium are retaining the current line editor for the game too. Between a solid new RuneQuest and Pendragon coming back to Chaosium and Call of Cthulhu remaining the king of the Lovecraftian gaming space, it really does seem like Chaosium’s returning to its former glory. If the current management can just negotiate a deal with Michael Moorcock – who the old regime managed to annoy enough to make him pull the Stormbringer licence – then they’d really have all of their “greatest hits” back together under one roof. Update: Nocturnal just posted an update to Paladin backers on this. They confirm that they remain responsible for delivering the backer rewards on the Kickstarter, which I guess would be one of the thorny points the negotiations behind this would have had to navigate. The print run for Paladin apparently had to be delayed a wee bit in order to co-ordinate everything for Chaosium, but is now back on track. I guess we’ll see if the books end up with a little Chaosium logo on them when I get them. So, my long-running Pendragon game seems to be more or less officially dead – it’s been on hiatus for a good long while, at any rate, and nobody seems especially anxious to rekindle it. I’m not too disappointed, though, because we got through about half the Arthurian saga and ended with Arthur claiming the Roman Empire for himself, at the very height of his powers, which is a reasonable stopping point. But now it’s done, I think it’s high time I offered my general impressions on the game line and its associated bits and bobs here. I’m of the view that a lot of the work Ron Edwards and other theorists did at the Forge, back when that place had an active RPG theory discussion forum before Ron Edwards declared the theory complete and shut the board down (one of many things Ron has done over the years which convinces me that he’s a really terrible academic), had a net negative effect on RPG discourse. The biggest achievement of the Forge, I think, was to provide the networking opportunities, pooled resources, mutual encouragement and exchange of advice necessary to cultivate a new wave of small press and self-published RPGs, but that has everything to do with logistical and commercial know-how and nothing to do with the RPG theory ideas they popularised. Whilst some Forge ideas are useful in a very few contexts (usually when talking about the failures of Forge theory, but occasionally for other purposes), equally a lot of it is quite jargon-heavy – and worse, it’s a jargon which is primarily engineered by someone (Ron) who makes it quite clear that there are some types of gaming experience he specifically wants to promote and be partisan towards, whilst there are other (commercially successful, critically successful, and enduringly popular) models of gaming he is actively and overtly hostile towards. This terminology obfuscates a lot of Forge rhetoric, and in addition if you buy into the terminology too much it becomes difficult to impossible to even talk about certain kinds of game. If you’re using Forge talk to talk about Forgey games, then it sort of works because the designers of said games tended to refer directly to those ideas whilst designing them; you can easily find the Creative Agenda because the designers made damn sure to include it prominently, for instance, In other cases, when discussing games designed by people with an entirely different outlook, using Forge jargon at best it feels like discussing Buddhism using exclusively definitions and terminology from Catholic doctrine (the jargon doesn’t even relate to the material in question), or trying to discuss which variety of socialism is better whilst exclusively using definitions from anti-Communist literature (the jargon is actively hostile to even contemplating the sort of ideas you’re trying to express). This is a shortcoming when you want a terminology to talk about RPGs in general, but I suppose it’s a boon if you want to encourage the development of a particular type of game which isn’t well-served by major publishers (due, in part, to the necessity to go for a big tent approach when you get past a certain scale). Story Before play is exemplified most obviously by prewritten modules and more or less all the refereeing advice White Wolf has ever written: the referee devises a prewritten plot before play commences (whether they do it for the entire campaign in advance, or immediately before each session). Here, storytelling is an exercise in planning out a plot arc for the campaign to follow. Story Now play uses overt system methods to drag the process of telling stories into the context of the session itself. People have raging arguments about what this means because they often are working from different definitions of “story”. For example, if you define “story” the way Ron does, it’s “Commitment to Addressing (producing, heightening, and resolving) Premise through play itself”, then game mechanics which hardwire in a premise and steer the process of play towards presenting, heightening and resolving it are Story Now mechanics. (Dogs In the Vineyard was a good example of this, though I confess I sold my copy ages ago so I may be misremembering.) If you don’t agree with Ron’s definition of story, of course, the same Story Now techniques which tickle his pickle will set your teeth on edge and make your palms itch. Games gunning for Story Now generally try to minimise the distinction between “telling a story” and “playing the game” as they humanly can. Since the easiest way to understand the concept is as denoting when the bulk of the work of story construction happens, you could propose a fourth type of play: Story Never. This would be almost indistinguishable from Story After, except the effort to construct a story based on what happened in the game never actually happens: the RPG is approached not as an engine for creating stories but as a simulation for exploring worlds, and the stuff that happens in a session is, like the events of real life, just a bunch of stuff that happens rather than part of a cohesive story. Ron never talked about Story Never, mostly because he was working on the basis that nobody would ever dream of playing an RPG without thinking about story. So, it transpires that the “beginners” I had previously agreed to run a game for aren’t actually as inexperienced as I had been led to believe, which at least meant I could go a little more broad in the selection of games I could suggest for them. In the end, we went with Greg Stafford’s excellent Pendragon, since the group wanted something fantasy-based and historically themed. We just had the character generation session, and player feedback is very good. 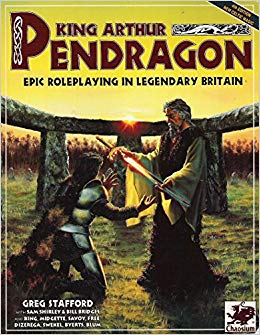 Pendragon is the only game I can think of which does the whole Forgey “let’s make a very focused game about a very specific range of characters for a tightly defined play experience” thing and actually makes it work for campaign play. (This is impressive considering that it first came out in 1985, but there you go.) The primary way it accomplishes this is by encouraging a focus on the player characters’ families; you usually only go on one adventure a year, with downtime spent dealing with the management of your knight’s manor, and whilst the effects of aging can be staved off for a while, sooner or later it’s going to hit you like a hammer. Since the Arthurian saga goes on for decades, this means player characters need to rear heirs who can take up adventuring once their parents are too elderly for quests. The plan for the moment is to play a short campaign and then see how we feel about continuing, but there are still benefits to incorporating this family-based stuff in the game. Notably, for characters beginning with the game’s assumed starting premise (knights of Salisbury in King Uther’s time), there is offered an optional system for randomly determining the deeds and cause of your father and grandfather. The players decided to go with this option and it went down really well, because it’s basically a method of giving them 75 years of backstory to give the action of the game some context without just tossing an enormous background document at them and saying “here, read this”. By making a game of the backstory, the players become invested in it, and even though the starting Glory you get from it tends not to be that different in the end (all the PCs are within about 100 points of each other), there’s still fun to be had from working out whose father was most prestigious. I was worried that character generation would spill over into two sessions, but actually once this history part was done statting up the player knights was a brisk process – and I think it helped that we got some form of gameplay out of the evening through the history generator, even if it is mostly random chance. Each of the characters seems to have already developed a distinctive niche of their own, in part through the history process and in part through the personality traits system, and I think everyone is excited to see what happens when we unleash them on Dark Ages Britain – I know I am. I’ve said before that if a character generation isn’t fast, it should at least be fun, and Pendragon seems to get the best of both worlds – family history generation is fun, and generating subsequent PCs within a particular family is fast.